Thanks, Mr. Izzard. I enjoyed and appreciated your candid narrative and the spontaneous extra footnotes. A great " read" and a close personal " chat" from the world's most famous action transvestite.???? I've been a fan of Eddie since '98. I have the book signed. Since I didn't want to ruin my copy, I got the audio. Best thing ever! There are extras in the audio that you don't get in the book. Extra endless footnotes! Keep up the good work Eddie! I can't wait for the next project. Eddie Izzard is absolutely positively hilarious and a remarkable human being. 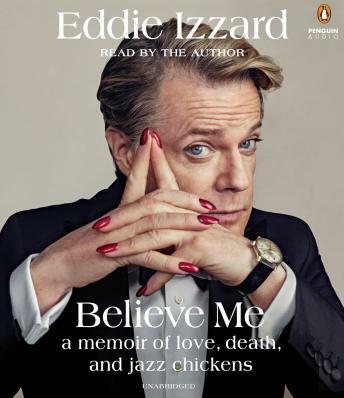 Instead of denying, fretting and wallowing, Izzard integrated his personal proclivities and grief of losing his Mum at a young age; giving him the audacity to create an outrageously successful career. How did he do it you ask? Well you will just have to read or listen to his book and learn the luscious secrets to his success. Believe me you will not be disappointed. You will be richly inspired and quite amused! Audio book PS: Love, love, love those live footnotes! Smart, funny, touching! Everything I hoped it would be. Thank you so much, Mr. Izzard!